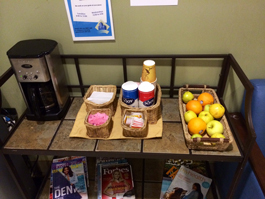 Women’s Wellness Center is a health and hygiene facility for homeless women located at 1900 2nd Avenue in Seattle. In a safe and peaceful environment, women can take care of their hygiene needs while being treated with dignity and respect. Showers, laundry facilities, toiletries and refreshments are provided every day (Monday-Sunday) 7:00am – 10:45am. These services are offered year-round with closures only for a few holidays. We are very lucky to now offer the services of an RN. Nurse Pam volunteers her valuable time, holding drop-in hours from 7:00 am to 10:45 am every Monday to meet with women in need. King County Public Health – We work year-round with the Community Health Nurse and Tuberculosis (TB) Nurse, as well as follow guidelines provided by Public Health for disinfecting the center, flu protocols and other related health issues that affect the homeless. 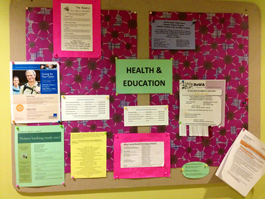 YWCA – A Health Care Access Program Advocate visits the center every Monday to meet with interested clients. She assesses their needs and connects them to health-related services, such as affordable healthcare coverage, medical and dental care, eye exams and glasses, pre-natal care and managed care information. Aloha Inn – A Benefits Case Manager from CCS’s Aloha Inn is available by referral to meet with clients about acquiring disability benefits. This includes fielding questions from clients who are unsure if they are eligible for SSI or SSDI, filling out the initial application with clients ready to apply, assisting with gathering medical evidence, acting as an Authorized Representative, referring denied clients to legal counsel and really walking with clients through the whole stressful process. Seattle University – The SU School of Nursing places nursing students here each winter and spring quarter to provide basic community health services such as foot care, blood pressure and blood sugar checks. We welcome volunteers who can donate services such as massage therapy, yoga instruction for people of all abilities, haircuts, pedicures and manicures, budgeting workshops, women’s empowerment or safety education and many other services, classes or trainings for the clients. We also occasionally need help with special projects around the center. The center depends upon the kindness of others for most of our hygiene supplies. We always need shampoo, travel size soap, razors, toothbrushes, combs, and facial, feminine and dental products. You may request an Items Most Wanted list—things that are currently in highest demand—by e-mailing Tara Adams, or you can download our always relevant Wish List for a general guide. This is a fun group project for your office, school, family, church or any group! We provide everything you need to get started – Hygiene Drive flyers, handled bags for collecting goodies, WWC brochures and our Wish List. You collect the donations and we will come and pick them up. Financial contributions allow us to purchase the supplies we need when we need them. It’s quick and easy to donate directly to the Wellness Center by clicking the blue Donate button on the right. You can give once, twice or monthly—a small monthly gift can really add up for our program! For more information about donation or volunteer opportunities at the WWC, please contact Program Supervisor Tara Adams at 206-256-0665. 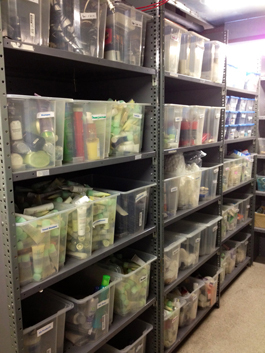 Main Storage Area: We try to offer a wide range of hygiene supplies, most of which are provided by our generous donors! 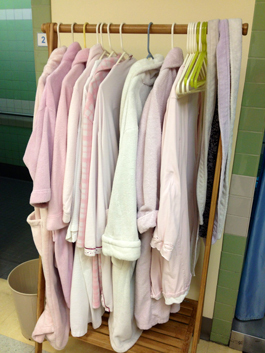 Robes: Many women only have the clothes they wear that day, so we provide fluffy robes for them to wear while they do their laundry. 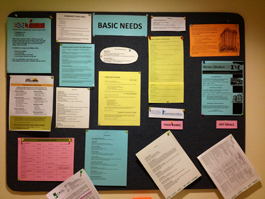 Basic Needs Bulletin Board: Provides information about local resources like shelter, food and clothing banks, mail services and free voicemail. 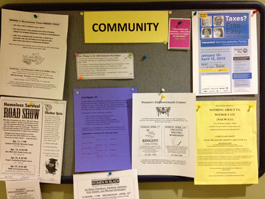 Community Bulletin Board: We post fun free events happening around town, as well as advocacy opportunities and memorial fliers. 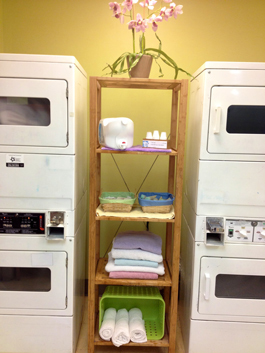 Self Service Station: Our guests can help themselves to laundry detergent and basic shower supplies. 7:00 a.m. – 10:45 a.m.